Bungie’s extending Exotic Masterwork perks and mechanics for weapons in Destiny 2: Warmind, which releases alongside Season 3 on May 8. Changes are coming to all Exotic weapons in Destiny 2: Warmind, and one of the biggest is to Exotic Masterwork acquisition and progression. Bungie decided to allot one Exotic Masterwork per Exotic weapon in Destiny 2: Warmind. In order to begin the Masterwork process, players will have to find an Exotic Masterwork Catalyst. “When inspecting the Exotic, there will be a hint at what activities can grant the catalyst for that weapon,” said Uyeda. Once acquired by the player, they can apply the catalyst to immediately enable orb generation on double kills. Weapons with a catalyst applied will also track enemies the player has defeated, similar to Legendary Masterwork weapons. 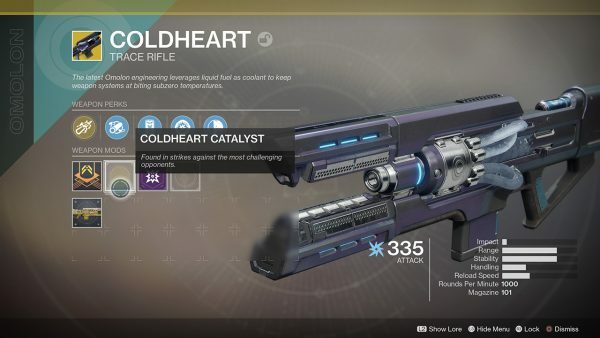 Exotic Trace Rifle Coldheart was used as an one example, as you can see in the images. Bounty-like objectives will be made available after a catalyst is applied. Objectives will need to be completed in order for the player to upgrade to the final Masterwork state. Once the Exotic is upgraded, it will award stat/perk bonuses. Masterworks can require a player to complete one or multiple steps. Each will vary in difficulty and length, and not be determined by random number generator (RNG). 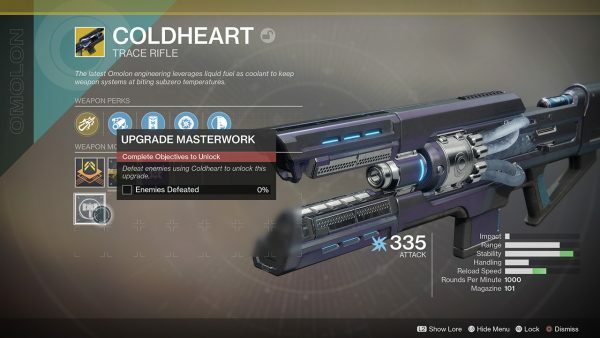 Players can expect some Exotic Masterworks to be tied to difficult activities or in-game accomplishments. Bungie provided a rundown of specifics which should make things a bit more clear. Exotic weapon Masterwork pursuits only need to be done once per account. Duplicate drops of an Exotic weapon via engrams, milestones, or even the Exotic Collection will be initialized at the current Masterwork upgrade state. Exotic Masterwork process takes place fully in the weapon details screen. There won’t be any objectives that take up character inventory space. Not all Exotic Masterworks will be available immediately when Season 3 begins. If a player inspects an Exotic Weapon and a Masterwork socket is not visible, the catalyst is not yet available. Bungie won’t publish guides on how to acquire specific Exotic Masterworks. Acquisition rates and community reaction will be monitored once the changes have been made. This will allow the team can make needed adjustments. Bungie also discussed Tractor Cannon, Hard Light, and Borealis, and other weapons changes related to the sandbox. The team has been discussing upcoming changes which will make Exotics “feel more exotic” over the last couple of months. Arekkz goes over some of these changes, and explains it much better than I could. Give it a watch. Destiny 2: Warmind will run you $19.99 or the regional equivalent when it releases on May 8.